Let’s be honest, there are some cars that cause a stir in every male’s pants, no matter if you are a Holden man or a Ford man. The HK Monaro is one such beast. Built in the era of true muscle cars, when the machines packed gorgeous bodylines with big pumped guards, a fantastic range of colours, a great striping package and a big motor that went pretty well for the time. Rob Cinanni is one such bloke who always dreamed of owning one for himself in high school and is now living the dream. 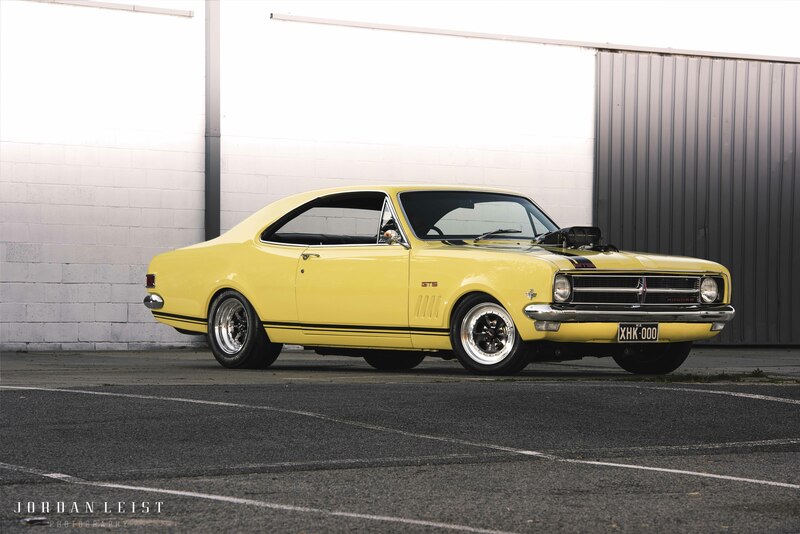 Running through a solid list of modified cars Rob has owned over the years — including a 10 second, 400-cube HQ he still owns — the desire to get that Monaro was just too much. So back in 2013 he went on the lookout for some muscle car gold: “I located the car over in SA. It seemed pretty decent in the pics so I flew over just to confirm it. The car was in primer, minus a heap of panels but it was in good nick. The motor was good for 11s and it was already mini-tubbed and had the 9-inch diff too. I could see the potential in the car so I flicked the guy the cash and that was that,” explained Rob. Back at home, the ideas for the build started to flow. “I have always wanted a blown motor so I sold the engine in the car. Then it came down to colours. The factory Warwick Yellow was always my favourite when I was growing up. It is understated but looks so good with the black stripes and the interior. For me, it was the obvious choice,” says Rob. So with a basic direction for how he wanted the build to go, Rob got to stripping the car. “To be honest, the car wouldn’t look as good as it does now if it wasn’t for all of the work that my good mate Marco Marchini did. He is like an unsung hero of ours. He does some amazing work on pinball restorations and just has a creative energy about him. I did a lot of the panel work myself but Marco was the one with the finesse and skills to make it perfect. He even painted the car for me in a dodgy lean-to. When people comment on how good the paint is I have to laugh. If only they could see where it was done, they would be blown away,” laughed Rob. I hate to admit it, I was one of the people who said that the paint looked good and it really does. The new stripes, the new badges and the fresh chrome work all do their bit to improve the aesthetics of the old girl. With those high school dreams cemented in his head, the interior was going to be a simple task: “Why mess with perfection? Original is best. I can’t see the point of fitting aftermarket seats and changing the colours of the trim and such. The factory look will never go out of style.” There was a need for a few changes though, but Rob did his best to make them subtle: “I mounted the gauges under the dash so they are out of the way and I don’t even run a tacho. I have a shift light for when I need it but I know what my engine is supposed to sound like so I go by ear.” Along with the gauges there is the neatly-mounted, TCI Outlaw shifter that controls the Abruzzi Turbo 400, reverse patterned ’box. If there is one thing that Rob knows about, it is motors, and his personal choice is the 400-cube Chev. When it came to bolting together the ultimate blown motor for the street he enlisted the skills of another good mate, Moose. “What can I say about Moose? He is just a really switched on guy when it comes to engines and machine work. He knows more than I will ever know, even to the point where he grinds his own camshafts at his workshop Ranch Automotive. The Monaro runs one of his cams and we refer to it as the Gorgonzola solid roller,” laughed Rob. With limited time on the dyno, Rob has been making the most of cruising the streets to see how the car goes. “It is making decent power, you can just tell. On the dyno, the car just blows the tyres off. We went down to Motorvation and ran the car down the strip and just blazed with a full car of people. My mates loved it!” The punters loved it too, every time I walked past the car there was a crowd of people around it. I guess everyone wants a Monaro. What an awesome bunch of photos and great write up. Loving the blog Jordan !!! I appreciate the feedback and the support.